You’re in the car. You’re waiting in line. You’re driving somewhere. So many chances to try to read a new story. But sometimes it isn’t convenient to have a book or Kindle in your hands. Grab the earbuds or a speaker and you can listen to your favorite stories instead. I’ve been trying to get more into audiobooks to extend my reading time and relaxation. We all love when our kids get excited about books, but between running errands, doing chores and scrubbing magic marker “art” off the walls, it can be tough to get excited about books for ourselves (let alone find a quiet moment to actually sit down and read). Audiobooks.com believes that reading great books (or any books, really) makes a person happier, helps them learn and makes them grow. And if we encourage our kids to read more, shouldn’t we do the same? Audiobooks.com is giving away a FREE one-year subscription so you can take your favorite books anywhere, anytime. Get inspired, educated and entertained by books whether you’re commuting, at the gym, doing dishes or on a weekend road trip with the family. 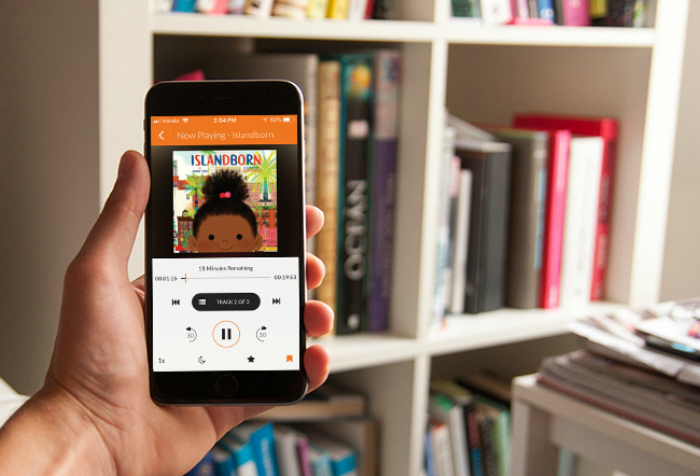 Instantly stream and download more than 100,000 incredible audiobooks to your smartphone, tablet or computer.